Fuel is of little use if it can&apos;t be safely and reliably stored and transported from the vessel&apos;s tank to the equipment that craves it: engines, gensets, wing engines, heating systems, and so on. 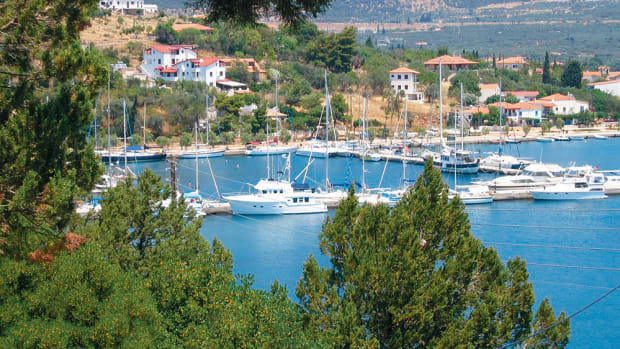 The guidelines set forth by the American Boat & Yacht Council concerning the design and installation of fuel tanks, plumbing, filters, and associated gear leave little room for interpretation. The boatyard that I manage and many other boatbuilders follow these guidelines to the letter, but, regrettably, not all yards and builders do. The fuel equipment on many boats that I inspect violates these important standards, often on several counts. Materials from which marine diesel fuel tanks are manufactured include, in order of how commonly they&apos;re found in existing vessels: aluminum, high-carbon steel or black iron, fiberglass, plastic, and stainless steel. Aluminum has made its mark on the marine industry in many ways. It&apos;s used to build everything from entire vessels to seat frames to a variety of items in between. It&apos;s light, strong, easy to cut and weld, non-sparking, and corrosion resistant (provided it&apos;s installed, used, and maintained properly). ABYC guidelines weigh in on aluminum with the following requirements. Tanks must be constructed of 5000 series alloy, specifically 5052, 5083, or 5086 (note that 6061, a common marine aluminum alloy, is conspicuous by its absence from this list). The specified minimum thickness is 0.090 inch; thicker is nearly always better when it comes to fuel tank material. 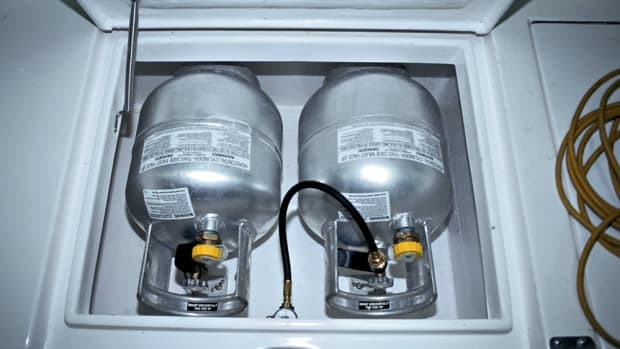 In the case of aluminum, the additional material can be thought of as sacrificial: if the tank begins to corrode, as aluminum tanks are wont to do, the additional thickness will give the boat owner more time to discover and correct the problem, hopefully before the tank begins to leak. My preference is for a minimum thickness of 0.125 inch in ordinary applications and 0.250 inch for tanks installed in harsh, frequently wet environments, such as those found under cockpits or in deep bilges. Aluminum tank manufacturers often offer to coat their tanks with corrosion-inhibiting epoxies. This may be tempting, but, in my opinion, it is more cosmetic than functional. Aluminum is quite corrosion resistant on its own, provided it is exposed to circulating air and is not repeatedly exposed to stagnant water. If the epoxy coating on a tank becomes damaged (a single nick or scrape is all it takes), then corrosion can gain a foothold, and it can progress in an especially aggressive manner. You&apos;ve probably seen this type of corrosion occur around fasteners on painted aluminum structures such as masts, window frames, doors, and hatches. Water works its way beneath the epoxy coating, where oxygen is not present, and this causes the aluminum&apos;s natural corrosionresistant film to break down. The corrosion often attacks beneath apparently sound paint, where it can&apos;t be seen, the only evidence being a bubble or other irregularity in the paint&apos;s surface. Poke it with the tip of a knife or even a fingernail, and the paint falls away, revealing white, sticky (if it&apos;s still wet) hydroxide, the detritus of aluminum corrosion. Thus, my preference is to leave fuel tanks and all other aluminum structures in an uncoated state, as long as their naked appearance can be tolerated. Aluminum&apos;s primary weakness is its susceptibility to several forms of corrosion. Of greatest concern is galvanic corrosion, which occurs when incompatible metals are attached to each other in a wet or damp environment (that is, anywhere aboard a boat, above or below the waterline). Aluminum resides very low on the galvanic scale, a scale that ranks metals according to their "nobility," or resistance to galvanic corrosion. Therefore, contact with nearly every metal (besides zinc and magnesium, which are less noble than aluminum) will cause it to corrode, but in varying degrees. Of particular concern are copper alloys. Kryptonite is to Superman what copper, and bronze and brass alloys, is to aluminum. Thus, every effort must be made to isolate copper alloys from aluminum. Bronze and brass plumbing fittings must never be directly attached to aluminum fuel tanks. A 300 series stainless-steel insulating bushing should be used between these incompatible metals. Even condensation dripping from a copper, brass, or bronze pipe will carry copper salts. If such a pipe resides over an aluminum tank, the dislodged copper molecules will slowly work their way into the aluminum. Aluminum also can suffer from a phenomenon known as poultice corrosion, which occurs if the metal is allowed to remain in contact with a hydroscopic (water-absorbing) substance such as carpeting, acoustic insulation, or even wood. Acoustic insulation should never be adhered directly to any metallic tank. Even nonhydroscopic materials, such as plastic and fiberglass, can promote poultice corrosion by holding water in a slim gap between the impermeable material and the aluminum. This is what happened in the case described above, in which stagnant water was trapped under a painted surface. Later, we will discuss how specific tank installation methods can help avoid poultice corrosion. Steel fuel tanks predate aluminum and owe their existence in recreational boats to their widespread successful use in commercial marine applications. Steel&apos;s greatest strength is its low cost. It is one of the least expensive customizable fuel tank fabrication materials. While it&apos;s not as light or as easily cut as aluminum, it is exceptionally strong and can be built to fit the available accommodations. Steel tanks often are made of thicker plate in order to account for sacrificial rusting. Because the material is relatively inexpensive, more can be used without appreciably driving up the cost of the tank. ABYC guidelines for steel are straightforward enough: it must meet ASTM standards A653/A or A653M-02A and be a minimum of 0.0747 inch thick. Again, thicker is better. As many car owners know, steel rusts. Unlike aluminum, however, steel is not particularly susceptible to other forms of exotic corrosion. In decades past, many steel tanks used in trawlers were swathed in fiberglass fabric and resin. This was a noble attempt to prevent corrosion, to be sure, but an ill-fated one, as revealed by the passage of time. It&apos;s extremely difficult to entirely encapsulate a tank in fiberglass. Water invariably leaks in around fittings. Once it does, rusting ensues, often at a rapid pace. Steel also differs from aluminum in the respect that it must be properly prepared and coated, preferably with an epoxy primer and topcoat. Ideally, steel tanks should be degreased, abraded, and coated as soon as the manufacturing process is complete to minimize oxidation and rust formation. Fiberglass fuel tanks are gaining in popularity, and with good reason. Fiberglass is as strong, resilient, and long lasting as the hulls, decks, and cabins of the vessels we cruise aboard. A number of production and custom boatbuilders have switched to fiberglass as their tank material of choice. ABYC is mute on the subject of fiberglass tanks other than to say that "all other requirements of this standard [ABYC H-33 Diesel Fuel Systems] must be met." However, this should not be construed as a black mark. It probably has to do with the fact that not many fuel tanks are made from fiberglass, but, more importantly, it also may have to do with the fact that very few fiberglass tanks have failed. Several years ago, the boatyard I manage installed inspection ports in a 30-year-old boat&apos;s fiberglass fuel tanks. The tanks were heavily contaminated, and debris was removed in 5-gallon buckets. Once the fiberglass had been steam-cleaned, it appeared to be in like-new condition. Fiberglass is virtually immune to corrosion and other structural failure issues. Like your vessel itself, and like aluminum and steel tanks, fiberglass tanks can be custom made in a variety of shapes and sizes. I&apos;ve been quoted as referring to fiberglass as the "forever" tank material. While this may be hyperbole on my part, fiberglass is exceptionally long lasting, provided the proper resin (vinyl ester or epoxy) and scantlings are used. Related to fiberglass as a tank fabrication material is cross-linked polyethylene, or XPE. It&apos;s been in widespread use for a number of years in both gasoline and diesel applications (most of those red plastic outboard fuel tanks are made from XPE). XPE has a number of notable attributes. Like fiberglass, provided it&apos;s properly manufactured and installed, it&apos;s virtually corrosion proof and is highly unlikely to otherwise fail structurally. Most XPE fuel tanks are rotationally molded, which makes them seamless and thus virtually leak proof (fittings, of course, may leak if not properly installed). XPE is also relatively inexpensive when compared with other tank materials. So, what&apos;s not to like about XPE? It does have a few drawbacks. Because of its flexibility, it cannot support the installation of inspection or clean-out ports. This is a significant drawback because nearly every diesel tank requires cleaning at some point in its life, often more than once. Because of the roto-molding process, XPE tanks cannot be manufactured with full baffles (partial baffles, or "speed bumps," can be molded into these tanks). For smaller tanks, under 50 gallons or so, the lack of baffles probably isn&apos;t an issue; however, for larger tanks, it may present a problem. Additionally, because XPE tanks cannot be cut or drilled, they cannot support the addition of supplemental fittings for equipment such as diesel heaters or polishing systems. Essentially, what you buy is what you get, and if the tank becomes contaminated, you may be forced to dispose of it. A final note on XPE: these tanks undergo what&apos;s known as hydrocarbon expansion, which causes them to grow between 3 and 5 percent upon their first exposure to fuel. While this is a onetime event, it must be taken into account (a 45-inch-long tank could grow to 47 inches). Cribs, cleats, straps, and other tank supports must be adjustable to accommodate this expansion. My article "Tanks: Fuel, Water, and Holding" in the June &apos;01 issue of PMM included a discussion on fuel tank materials. At that time, stainless steel had not been approved by ABYC for use as a diesel fuel tank material, other than in 20-gallon cylindrical designs with domed heads (an impractical design at best). I&apos;m pleased to report that the guidelines changed when the diesel fuel system standard was reissued in 2005. Now, stainless steel may be used for fuel tanks, provided the metal meets all other relevant ABYC requirements, essentially those outlined earlier for other metallic tank materials. Stainless steel, if used for fuel tank construction, must be of the 316L or 317L alloy variety and a minimum of 0.0747 inch thick. As most cruisers know, stainless steel is an exceptionally durable, long-lived material. Provided it&apos;s properly designed and constructed and the correct stock material is used, a stainless fuel tank will serve you well. Stainless steel that is exposed to wet, oxygen-depleted environments will sometimes suffer from a phenomenon known as crevice corrosion. Much like aluminum, stainless steel must be exposed to a fresh supply of oxygen in order to remain corrosion free. If starved for oxygen while wet, pits or crevices will begin to appear on the metal&apos;s surface. Once these materialize, the process accelerates as the pits form small galvanic cells. The key to enabling a stainless-steel tank to live a long life is keeping it dry (on the outside) and exposing it to circulating air. Finally, the "L" suffix after the alloy designation refers to its low carbon content, a prerequisite for any stainless steel that is to be welded. If stainless steel that is welded is not low carbon, weld decay (also called "carbide precipitation") will occur: a narrow boundary on either side of the weld will be become susceptible to corrosion in much the same fashion as ordinary steel. I&apos;ve mentioned inspection ports several times already, and that&apos;s no coincidence. While many boat and tank manufacturers consider these to be optional, I don&apos;t. No diesel fuel tank should be designed or built without inspection ports that afford access into every baffled chamber. Eventually, you will have to access your tank for cleaning. Diesel fuel is inherently sediment laden, and it supports microbial life. Cleaning is simply a fact of life. If you have a polishing system, do you still need inspection ports? The simple answer is yes. Polishing systems may not remove rags, plastic wrappers, the fuel stabilizer container&apos;s foil cap, construction debris, or other items that might end up in the tank. As mentioned previously, the cost of including inspection ports in a tank when it&apos;s being manufactured is often miniscule when compared with the cost of the tank. (Read Bob Lane&apos;s article "What&apos;s In My Tanks?" in the September &apos;06 issue to learn more about cleaning tanks and installing inspection ports.) Adding a polishing system to a vessel that didn&apos;t previously have one often requires the installation of inspection ports, so you could very well end up with ports by default. While inspection ports cannot be included with or added to XPE tanks, every other tank material I&apos;ve mentioned will support them. Ideally, inspection ports should be fastened using through-bolts rather than tapping screws. It&apos;s difficult to obtain the necessary clamping pressure required to make a liquid- and vaportight seal by setting a tapping screw in a relatively thin or soft material such as steel or aluminum without stripping the threads inside the tank. Once the thread is stripped, the fastener becomes ineffective and a virtually guaranteed leak source. When a tank is manufactured, through-bolted ports (using fine-thread machine screw fasteners or studs) can be installed easily. But beware: many tank manufacturers will be reluctant to do this because they believe ports to be leak sources (true, if they are not installed correctly) or they will install inspection ports using tapping screws. If your current tank does not include inspection ports, don&apos;t worry. It&apos;s relatively easy, though occasionally time consuming, to add them. Aftermarket stainless-steel and aluminum inspection port "kits" are available (see the sidebar on page 102). Remember: plan on installing at least one inspection port in every baffled chamber. 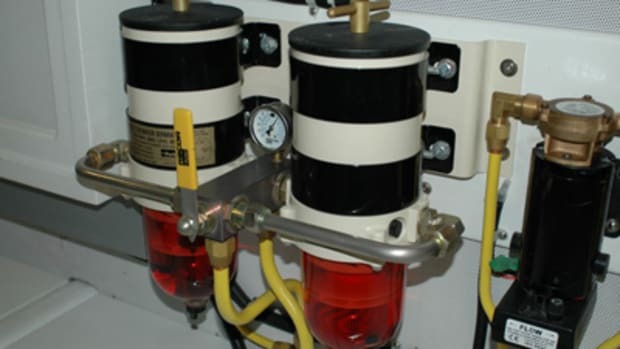 Ports can be installed in either the top or the side of a diesel fuel tank; the former is preferred when access permits. Even if you have to move a fuel tank to access its inspection ports, they&apos;re still worth having. The alternative is having no access to the inside of the tank under any circumstances. A fuel tank that comes loose in the engineering spaces of any vessel while under way presents a potential catastrophe. The same is true of a tank that shifts slightly and remains that way for hundreds or thousands of running hours. Both tanks are candidates for failure and leakage as a result of chafe or abrasion. Fuel tanks should be secured in such a way that they do not move even a fraction of an inch. This can be accomplished in several ways. Often, a tank is cribbed in place; a wooden structure is built around the tank to keep it secure (a holdover from the days of timber vessels). This works, but, for metallic tanks, it presents the risk of increasing the likelihood of poultice corrosion by trapping water against the tank&apos;s surface (even wet wood will allow this type of corrosion to occur). If cribbing is used, a nonhydroscopic insulating material must be placed between the tank and the cribbing material, and the insulating material must be adhered or bedded to the tank so water cannot find its way in between. The insulating material can be made of high-density polyethylene, closed-cell foam, or high-density synthetic rubber. Whichever material is chosen, it&apos;s important to ensure that it cannot absorb and hold water. The surface of the tank where the material is to be adhered should be degreased and then lightly abraded using a 3M Scotch-Brite pad or 220-grit sandpaper. Degrease the surface again after abrading and then apply a polyurethane bedding compound. Finally, bed the insulating material (it, too, should be degreased, abraded, and degreased again) in the sealant. Once the sealant cures, the cribbing can be installed. The bottom of the tank should be treated similarly. Many builders install tanks on 1- or 2-inch-wide, 1/4- inch-thick (at a minimum) strips of one of the abovementioned insulating materials, spaced 1 or 2 inches apart. The strips should be placed athwartships, port and starboard, to allow water to drain when the vessel rolls. The primary objective of this non-hydroscopic exercise, an ABYC requirement for all metallic tanks, is to keep the tank from remaining in contact with water, particularly stagnant water. An alternative to cribbing involves the use of mounting flanges that are attached to the tank when it&apos;s manufactured. 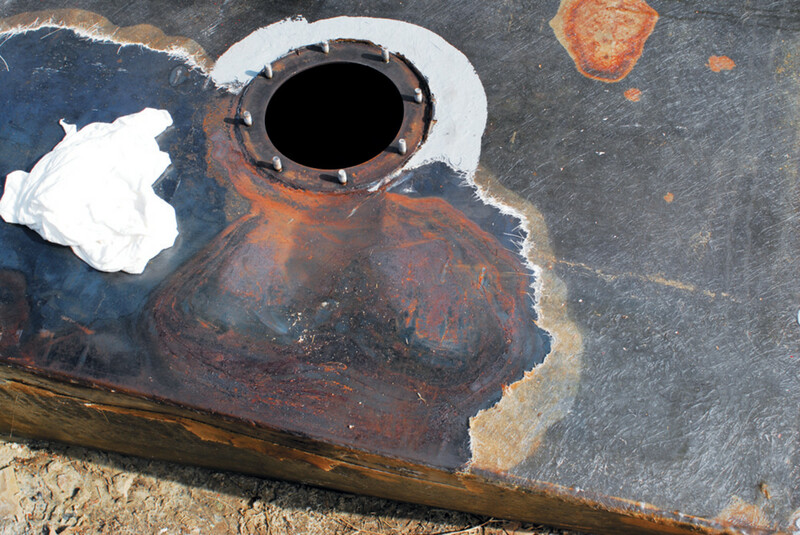 (While corrosion is not an issue for fiberglass tanks, they, too, may benefit from flanges.) Flanges negate the need for cribbing, straps, or other supporting structures and help avoid corrosion. Flanges also enable the tank to be through-bolted to a sufficiently strong substrate, such as a substantial fiberglass/plywood shelf. Tank mounts should always utilize through-bolts (a nut and a bolt) rather than tapping screws, and the tank should be supported across its entire bottom. Ideally, the tank should not be suspended in midair between stringers or frames, although this may be difficult to correct or avoid in existing installations. If you are having a vessel built, remember that careful consideration and forethought should be given to the mounting, flange installation, and security of the fuel tank(s). Once the vessel has been built and the tank has been installed, it&apos;s too late to add flange mounts and shelves. Related to the issue of water entrapment between mounts, cribbing, or supports and the tank itself is the subject of drainage. 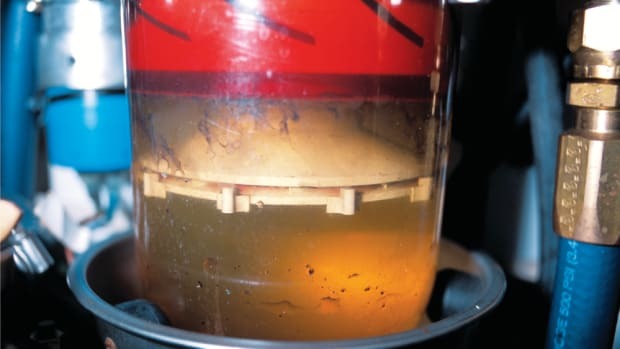 It comes as a surprise to many cruisers, other than those who have experienced it, that one of the more common corrosion-related failure scenarios involves the top, rather than the bottom, of metallic tanks. This problem stems from deck leaks, which are almost guaranteed to occur at some point. Common boatyard wisdom holds that deck hardware bedding is good for no more than 10 years, and sometimes less, depending on how the hardware was installed and if it was installed on teak decks. (Sealant doesn&apos;t adhere as well to teak because of the wood&apos;s porous, oily nature.) If the bedding under a cleat fails, water may leak onto your bunk or into the saloon. This is annoying but hardly catastrophic. However, if the deck fuel fill bedding fails and leaks and it&apos;s located directly above the fuel tank, as many are, the consequences could indeed be catastrophic. Just as it&apos;s undesirable to have standing water on top of your fuel tank, it&apos;s equally undesirable to have your metallic tank standing in water. If the aforementioned procedures are followed, it&apos;s unlikely that exterior corrosion issues will arise. However, if the tank is allowed to stand in bilgewater or other accumulated water, then corrosion is virtually guaranteed. Therefore, it is imperative that no metallic tank be allowed to rest in water. Tanks should be installed well above the normal "high tide" mark of any bilge. 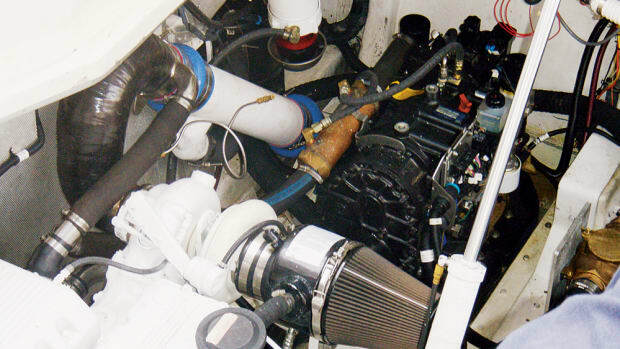 A clogged or leaking pickup tube will bring even the most well-designed fuel system to its knees. If the tube is removable, the problem is easily resolved. If it&apos;s not, the repair becomes much more challenging. Pickup tubes should not be equipped with screens. Dirt, debris, and other contaminants must be allowed to make their way to the primary fuel filter, where they are easily dealt with. If debris becomes lodged in a pickup tube screen, it is anything but easy to deal with. The tube must be removed and cleaned, and while having a removable tube makes this possible, given the choice, I&apos;d rather service the primary fuel filter element than remove a pickup tube. It seems appropriate here to say a few words about return tubes. Why does the fuel return require a return tube? Why can&apos;t unused fuel simply run back into the tank? Most engine manufacturers have specified the use of return tubes for several years now. Return tubes reduce aeration of the fuel; if the fuel runs through a tube rather than dropping like a waterfall into the tank, there is less splashing and less likelihood of air becoming entrained in the fuel. Air in the fuel can cause the engine to run poorly or even stop, and it also promotes oxidation or "aging" of the fuel. Once, in an emergency, I used a return tube as a backup pickup tube of sorts when the primary pickup tube failed. My primary pickup tube had cracked, causing an air leak that had prevented fuel from being drawn past the top of the tube. One final note about tank installation: every fuel tank must bear a label that is visible when the tank has been installed on the boat. The label must include the tank manufacturer&apos;s name, address, and phone number, as well as the month and year of manufacture (or the lot number). This way, if you or a technician has a question about the tank, the manufacturer can be contacted. The date will allow you to identify whether the tank is original equipment or if it has been replaced. Additionally, the label must include the tank&apos;s capacity, the material from which it&apos;s made and its thickness, the fuel for which it&apos;s been designed, the maximum test pressure, and the model number. The label may be adhesively applied, but it must be durable, permanent, and resistant to fuel, cleansers, and the elements. Fuel tank repair and removal can be daunting prospects. However, if your fuel tanks are designed and built properly and you keep them dry, clean, and secure, you&apos;re unlikely to face either of these unpleasant chores anytime soon. Additional information about fiberglass tanks and ethanol, tank pressure tests, tank connections, and baffles is available in the "Web Extras" for this issue at passagemaker.com. Steve D&apos;Antonio is PMM&apos;s technical editor and vice president of Zimmerman Marine, a full-service boatyard and custom boatbuilder in Cardinal, Virginia.